On 15 December 1989, Gen. Manuel Noriega, commander of the Panama Defense Forces, was appointed by his handpicked legislative assembly to be the nation's "maximum leader." In his acceptance speech, Noriega announced that "the Republic of Panama is declared to be in a state of war" with the United States. Although he stopped short of advocating an armed response to his imaginary conflict, his incendiary language reflected the tension that had grown between his government and the U.S. over the previous three years. 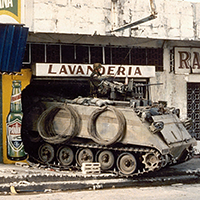 Noriega had involvement with drug trafficking, repressive political activities, and numerous treaty violations and documented episodes of PDF provocations that had helped to escalate the crisis. His speech set the tone among his followers, who would soon provide the catalyst for a U.S. military intervention into Panama named Operation Just Cause.